Since the invention of the detective story in the mid- to late-1800s, people have always loved a good murder-mystery  following the killers trail from the scene of the crime, finding and piecing together hundreds of clues, small and large, and finally reaching that defining Aha! moment and the solution of the case. Scientific research, while perhaps less heart-pounding, often follows a similar plotline. Murder may seem a rarity in such investigations, but off the Yucatan Peninsula of Mexico, geoscientists are tracking the biggest killer of all. Ancient Maya ruins abound on the Yucatan Peninsula in Mexico, in and around the Chicxulub crater. 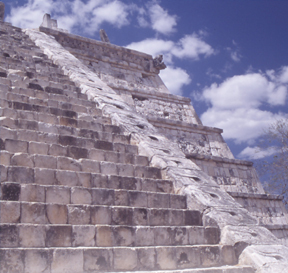 Pictured here is the pyramid at Chichen Itza. At Chicxulub, geologists are investigating an extraterrestrial impact that occurred 65 million years ago. Photo by David Kring, University of Arizona. Here, a crater approximately 180 kilometers wide  and buried under hundreds of meters of sediment  holds clues to what killed the dinosaurs. And around the world, a distinct layer of clay a millimeter to several centimeters thick has provided researchers with further insight into the mysterious case. Piecing together exactly what happened 65 million years ago is no easy task. What researchers do know is that a 10- to 15-kilometer-wide extraterrestrial projectile slammed into the Gulf of Mexico. It was one of the worst days in the last billion years of Earths history, says Jaime Urrutia, a geoscientist with the National Autonomous University of Mexico (UNAM) who is working on the Chicxulub case. Around the same time, 75 percent of all species and 50 percent of genera, including the dinosaurs, disappeared. Over the past 25 years, most scientists have come to believe that the impact and the extinction event are inextricably linked, although there is still much debate about the details. Before the researchers can convict the Chicxulub projectile, they need to determine its modus operandi. To that effort, in a truly international collaboration, geoscientists recently drilled more than 1,500 meters below ground with hopes of learning more about the nature of large-body impacts, and deciphering exactly what role the impact played in the mass extinctions at the Cretaceous/Tertiary, or K/T, boundary. 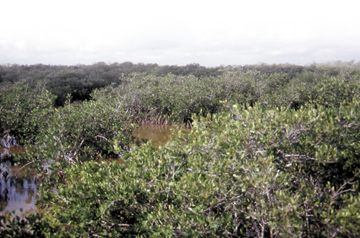 The researchers readily acknowledge that the impact had severe effects on the animal and plant life around the Yucatan. But the clues about how Chicxulub could have caused worldwide extinctions, they say, lie in the rocks and deposits at the crater site as well as those left around the world. With the latest drilling, I think we obtained wonderful subsurface information that will help us learn how large crater basins are formed, says Dieter Stöffler, a planetary geoscientist with Humboldt University in Berlin, who is one of the principal investigators on the drilling project. Determining how the Chicxulub killer worked is more difficult, however, especially because 300,000 years after the K/T boundary are missing from the drill core. Thus the latest drilling into the Chicxulub crater has yielded nearly as many questions as answers in an investigation thats been ongoing since the first dinosaur bones were discovered. The crater is named for Puerto Chicxulub, Mexico, a town near the center of the crater. Petroleos Mexicanos (PEMEX), Mexicos national oil company, first discovered the crater during oil exploration in the 1950s. PEMEX geologists noticed gravity and magnetic anomalies and drilled deep into the Gulf of Mexico. Although the company did not find oil, they drilled several more exploration cores throughout the 1960s and 1970s. After examination of the cores, the geologists realized that they had found an unusual structure, but thought it was a volcanic feature. The landscape along the Yucatan coastline over the center of the crater has no towering cliffs marking the rim of the crater, nor a vast depression marking the center. Photo by David Kring, University of Arizona. Meanwhile, scientists in Italy were noting anomalies in the composition of clays that define the K/T boundary  namely, that there was a lot more iridium, a common element in space objects such as comets and asteroids, than is usually found in Earths crustal rocks. In 1980, physicist Luis Alvarez and his son Walter, a geologist, first proposed that an extraterrestrial impact might have caused the K/T mass extinctions. Their research set off a worldwide search to find such a killer. Research throughout the 1980s supported the Alvarez hypothesis, including the finding of minerals in K/T boundary sequences around the world that showed evidence of pressure and strain rates higher than those produced by terrestrial processes (altered tektites, nano-diamonds and shocked quartz grains, to name a few). Additionally, examination of outcrops in Texas showed significant unconformities  theorized to be from a series of giant waves caused by a large impact nearby. After 11 years of study, researchers finally tied the gravity anomaly on the Yucatan Peninsula to an impact event. In a 1991 Geology article, Alan Hildebrand, David Kring and co-authors at the University of Arizonas Lunar and Planetary Laboratory, published these findings, dating the crater to 65 million years ago. Further examination of the breccias within the PEMEX cores gave the hypothesis even more weight. People finally began to believe that a large body from space could have hit the Yucatan and left a huge crater in its place. Thousands of kilometers of Earths crust were vaporized, melted or ejected from the crater, creating a fireball that swept around the world. The event explosively released the equivalent of more than 100 million megatons of TNT. The most recent drilling took place over two months, from late December 2001 to late February 2002, in Hacienda Yaxcopoil. The International Continental Scientific Drilling Program, a multinational program designed to further geoscience research in continental drilling, organized and funded much of the Chicxulub Scientific Drilling Project. Additional support came from UNAM, the Government of the Yucatan and the GeoForschungsZentrum-Potsdam in Germany. 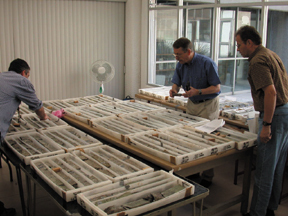 Dieter Stöffler and Berkhard Dressler, two of the Chicxulub principal investigators, look over the suevite ejecta cores at the National Autonomous University of Mexico lab. These cores could hold important clues as to what killed the dinosaurs. Photo by Jan Smit, Free University. Eight principal investigators from five different countries selected the drill site based on several factors, including the availability of water for the drilling and access to the site. They also looked at seismic profiles and other geophysical data that seemed to indicate that a thick unit of rocks metamorphosed by an impact (impactites) lay beneath 800 meters of Tertiary limestone, says Jan Smit, a geologist with Free University in Amsterdam and another principal investigator. The principal investigators thought theyd find several hundred meters of impact-altered breccia, called suevite, overlying a coherent impact melt sheet. The suevite would help characterize the target rocks and their deformation, Smit says, and learn more about impactite deposition. Working day and night, the UNAM team drilled a core about 60 kilometers from the center of the crater, outside of the initial, transient crater but inside the outermost ring. The scientists originally hoped to drill 2,500 meters deep; however, they only reached 1,511 meters. When the drillers finished, the UNAM crew washed the core, boxed it up and took it to their laboratory in Mexico City to be spliced into samples and shipped to scientists around the world to study in their own laboratories. Smit took a 70-centimeter-thick boundary-core section to the Netherlands, where he then distributed specimens for analysis. Researchers are now studying about 2,000 samples sent out from both labs. The sequence of impactites found in the core is around 100 meters thick, quite different from the 800 meters the principal investigators expected, but still within the range Hildebrand, now at the University of Calgary, predicted for that location in the crater. Additionally, sequences representing roughly 300,000 years of time are missing, arguably including the actual K/T boundary and transition and the sediments that formed at the beginning of the Tertiary. Where the researchers expected to find the boundary, Smit says, is a 70-centimeter-long segment that does not show the same iridium anomalies seen in the K/T boundary clay level around the world. However, some investigators still consider the suevite layer to be the actual K/T boundary layer within the crater, Stöffler says. They speculate that the crater fell dry after initial formation and that seawater only returned some 300,000 years later. The implication is that the ejecta and early Tertiary sediments eroded away because the crater was dry, or that a lack of seawater delayed the sedimentation itself, says Kring, who still works on the Chicxulub case. Hildebrand, who has criticized the choice of the drill site, argues that an additional reason the basal Tertiary sediments are missing is because the drill hole intersected a high point on the craters floor. The uppermost 800 meters of the core are mostly shales that filled in the crater after impact. Below that is about a 12-meter layer of redeposited suevite, which researchers think slid back into the crater after the initial ejection and fallout. The 86 meters below the redeposited suevite are suevite that ejected ballistically from the impact crater during formation. The researchers identified the lowermost 600 meters of the core as large ejected and rotated slabs of platform limestone, dolomite and evaporites, of which anhydrites comprise 27 percent. Many scientists, including Smit, believe that using the chemical composition of the platform rocks in climate models will help determine how much carbon dioxide and sulfur oxides the impact released into the atmosphere via vaporization, fires and other processes. These models in turn might be able to tell researchers how poisonous gases dealt the final blows to life at the end of the Cretaceous, Smit says. Knowing the amount of anhydrite, for example, would tell researchers how much sulfur Chicxulub spewed into the air: Smit hypothesizes the amount is several orders of magnitude more than has entered the atmosphere at any other time in Earths history. The current understanding of impacts is that the kinetic energy of the projectile transfers to the target upon impact, vaporizing or melting the rocks near ground zero and ejecting everything nearby (water, melted and vaporized rock, dust). That would result in a large transfer of water vapor, carbon dioxide and sulfur oxides into the air, as well as dust (see sidebar, page 22). Modeling indicates that worldwide, the dust and soot from catastrophic and widespread fires caused by the ejecta would have blocked sunlight, effectively cooling Earth for up to three months, and then the gases would take over, Hildebrand says. Sulfur oxides would keep temperatures low for up to a decade or so, he says, and eventually precipitate in the form of sulfuric acid rain, which could last a year. One of those three  the dust, sulfur oxides or acid rain  or a combination thereof, are the best leads we have toward finding the killer, Hildebrand says. Carbon dioxide, another factor, would add heat to the atmosphere and possibly the ocean a bit, he says. However, he is skeptical that warmth was the big killer. Earth, Hildebrand says, was nevertheless perturbed for at least a million years after the K/T boundary, according to deep-sea cores and climate proxies taken from sites around the world. Although scientists now have a better idea of the amount of the affected target rocks from this core, the carbonates and anhydrites are not undisturbed, Kring says. Thus, much more detective work is needed before scientists can use what is in this hole to accurately reconstruct the climate at the end of the Cretaceous and the beginning of the Tertiary, he says. Hildebrand says that much of the data is already there; more important is interpreting that data through better impact and climate models. For example, he wants to know if the acid rain would have been sufficient to acidify the surface layer of the ocean. Better computer models, Kring adds, will help scientists understand how specific ecosystems in various parts of the world reacted, or failed to react, to the environmental calamity. At least 180 kilometers diameter, the Chicxulub crater is one of Earths three largest impact structures (Sudbury in Canada and Vredefort in South Africa may be slightly larger), and it is the youngest and best preserved. Impacts of this size occur on Earth about once every 100 million years, says Urrutia, one of the principal investigators. Sudbury and Vredefort are nearly 2 billion years old and heavily eroded, though visible at Earths surface. Because Chicxulub smashed into an area of active deposition  a shallow sea  and was likely buried shortly after it formed, its interior morphology has been shielded from the effects of erosion. However, because Chicxulub is buried beneath hundreds of meters of sediment, researchers can only study that morphology through geophysical studies and drilling projects. Researchers have thus far interpreted Chicxulubs surface structure to be similar to what they have seen in images of large craters on the Moon and Mars  but there is ardent debate over the exact structure of Chicxulub. Beginning with that 1991 Geology article, Hildebrand and colleagues proposed and subsequently modeled Chicxulub as a 180-kilometer-wide peak-ring basin, based on gravity anomaly maps. During the ensuing decade, other researchers, also using seismic profiles, proposed varying sizes for the crater, from 195 to 300 kilometers diameter, and suggested that the crater has a multi-ring, rather than peak-ring, morphology. These varying hypotheses led to some of the contention about exactly where to drill the latest core. When the extraterrestrial body struck land, an initial cavity formed that was about 100 kilometers wide and 30 kilometers deep, but it collapsed within minutes to create the structure seen today, according to Jay Melosh at the Lunar and Planetary Lab at the University of Arizona, in a December 2001 article in Nature. The initial cavity represents the structural feature from which researchers can calculate the impact energy required to form Chicxulub, Hildebrand says, and is an important factor in determining the magnitude of subsequent environmental perturbations. Seismic studies indicate that a peak ring about 80 kilometers wide extends around a central uplift (caused by reverberations as the crater collapsed and re-formed). A ring of slumped terraces from the back-filling of the crater extends from 40 to 90 kilometers from the center, according to Hildebrand and Melosh. Chicxulubs outermost ring (the fault scarp) spans about 180 kilometers in diameter, and a ring of cenotes (water-filled limestone sinkholes) parallels this fault scarp. Of the three large terrestrial craters, Chicxulub is the only one that has a well-preserved outer structure, Stöffler says. As scientists have yet to drill the center of the crater, they do not yet know what the central impact sequence looks like. While Sudbury has a complete impact sequence exposed in the center of the crater, says Doreen Ames, a geologist with the Geological Survey of Canada, it has no ejecta outside of the crater because of erosion. Outcrops in Belize and Quintana Roo in southern Mexico show preserved out-of-crater ejecta from Chicxulub. The two structures together thus provide a rare natural laboratory in the understanding of large impact structures and their mechanisms of formation, Ames says. She wants to compare ejecta material, emplacement and depositional mechanisms at Chicxulub with Sudbury deposits in Canada. Ames also hopes to determine if Chicxulub had a hydrothermal system. With heat from the impact, melt sheet and seawater rushing back into a very permeable pile of rocks, the ingredients should be there, she says. Kring and other researchers are also studying the potential for post-impact hydrothermal systems at Chicxulub, and how similar systems may have affected early evolution, if not the origin, of life on Earth. Kring says hydrothermal systems may serve as a proxy to better understand the processes that occurred on Earth 3.9 to 4 billion years ago and thus how life might evolve on other planets, including Mars. Although researchers can see the morphologies of large craters from images from the Moon and other planets, they know almost nothing of what lies beneath the craters surfaces. Several research teams are looking at similar-sized craters on Mars, Mercury and the Moon also to understand the geologic processes associated with large crater formation. Kring says he wants to learn how much of Earths crust was melted with the initial impact and how the molten material mixed with the target rocks. He is also interested in the ejection and redeposition of clastic rocks in the crater. Another unknown in the Chicxulub case is identification of the actual extraterrestrial object that left Chicxulub in its wake: Was it a comet or an asteroid? Most asteroids originate in the asteroid belt between Mars and Jupiter and are pieces of rocky material remaining from the early evolution of the solar system. Comets tend to be balls of ice, dust and rock, and originate beyond Pluto. As they travel at nearly twice the velocity of asteroids, they are more likely to completely vaporize on collision, so it would be unlikely to find a piece of comet anywhere. Researchers have found suspected bits of the projectile around the world, and are comparing the textures and geochemistry of the pieces to chromium isotopes found in the K/T boundary clays. Thus far, they have found isotopic evidence that matches what they would expect for an asteroid, Stöffler and Hildebrand say. But the researchers do not yet have enough evidence to rule out a comet. To further reconstruct the impact event, Hildebrand and others are also comparing shocked zircons and tektites in the crater to those found in the K/T boundary clays. All the work to date indicates that the layer is the same, which would fairly definitively conclude that Chicxulub marks the end of the Cretaceous, Hildebrand says. But theres always more work to be done, he adds. The UNAM team is currently running seismic experiments in previously drilled holes to learn more about the craters structure and stratigraphy, and geoscientists around the world are studying pieces of the core. But as for the next drilling projects, money is the keyword, Smit says. Drilling projects are tentatively scheduled for 2004 and beyond, but the geoscientists have yet to secure funding. Once funding is in place, Smit and Ames both say it would be advantageous to drill closer to the center of the crater, if not dead-center, above the melt sheet. They theorize that the missing sequences might be there, as might evidence of hydrothermal vents and more information on the redeposition of sediments. Urrutia says another drilling might provide further clues as to how the biosphere recovered and repopulated. Stöffler and Kring would like to see a deeper drill hole, as originally planned for the most recent project. They would also like to see holes drilled at several spots across the crater, as has been done at Sudbury. After all, one single drill hole will not give us clear answers, Stöffler says. Hildebrand says that while further drilling of the crater itself might prove insightful, he would most like to see Chicxulub ejecta found in places such as the far east of Russia and India  as far away from the crater as possible  to look at the effects of Chicxulub in sedimentary records. And all of the scientists want to see further modeling that takes into account recent findings, to better understand the chain of events that caused the extinctions. As the extinction investigation pushes on, many people wonder if this is a mystery that will ever be solved. I think it will eventually settle out, Smit says. Stöffler agrees, saying that researchers have now established a very clear correlation between the clay layer found in the K/T boundary around the world and the impact that formed the layer. While researchers have identified whodunit, Kring says its not going to be easy to unravel the clues to solve the case of how Chicxulub destroyed life at the end of the Cretaceous. It happened in the blink of an eye on the geologic time scale, Kring says, and all the witnesses are long-since dead. Sever is a Geotimes staff writer.